In this CD training, Jeffrey Taylor addresses key issues to cover in your lease to eliminate rental headaches. These vital issues include: number of occupants, pets, appliances, alterations, upkeep, pests, damages, utilities, rent payments and the future relationship with your residents. As a bonus for ordering this CD, you will also receive a free copy of the expanded special Rental Lease report with 200 Rental Clauses To Better Protect You and Your Investments ($20 bonus value). It's critical to your financial and emotional health that you listen to this CD and review the report BEFORE you give out another rental agreement. Make your lease the best it can be this year. 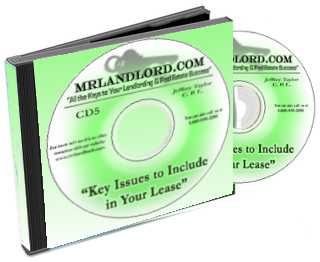 Order your copy of the new CD today - Key Issues To Include In Your Lease and we will also send you your free copy of the Rental Lease bonus report.